The Freedom From Religion Foundation is giving $10,000 in scholarship awards to four students in partnership with Black Skeptics of Los Angeles, an African-American atheist community group. 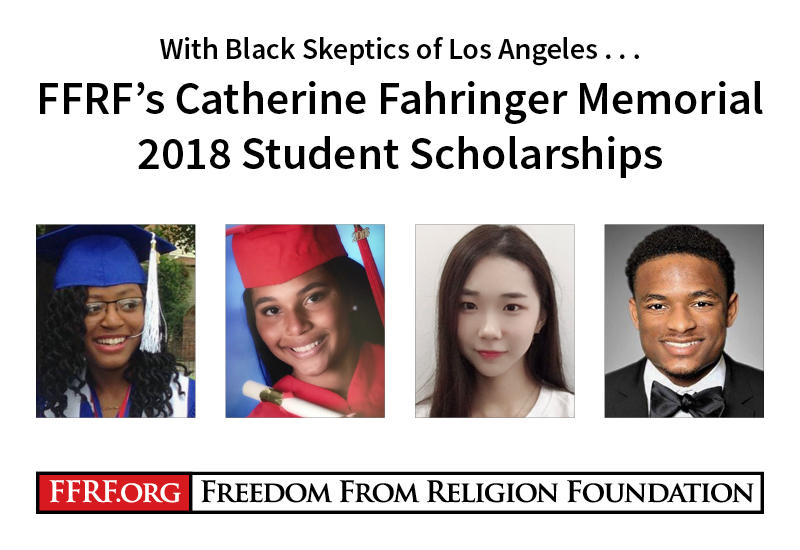 For the fourth year in a row, FFRF has divided its $10,000 annual Catherine Fahringer Memorial Award between four outstanding secular students of color. The scholarship is part of BSLA’s First in the Family Humanist Scholarship program, which focuses on undocumented, foster care, homeless or LGBTQ youth who are underrepresented in the college population and will be the first in their family to go to college. This year’s winners are: Huanchun Xu, 20, (Borough of Manhattan Community College); Mike Grimes, 18 (Honors College Charleston); Shalvit Grimes, 18, (St. John’s University) and Desmyon Jones, 18, (University of Memphis). Each recipient will receive $2,500 to support their college education and expenses. Fahringer, whom this award is in memory of, was a feisty feminist and freethinking activist in San Antonio who ran a long-lived FFRF chapter, and served on FFRF’s executive board for many years. She was especially interested in nurturing the next generation of freethinkers. She died in 2008. FFRF is a Wisconsin-based nonprofit organization with more than 32,000 members across the country, including more than 4,000 in California. FFRF, now celebrating its 40th year, works to protect the constitutional principle of separation between state and church, and to educate the public on matters relating to nontheism.